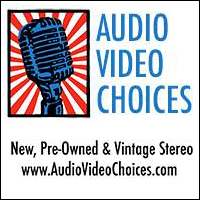 A majority of the audio world had a facelift in the early 1980s. The silver-faced receivers from the Japanese majors were replaced with separates here and abroad with a more modern look that could have been at home on the space shuttle. Adcom was one of the champions of reasonably priced high end gear that played beyond its price point. Nelson Pass was brought in as consultant for the now legendary GFA-500 series amplifiers that were designed with an austere black finish, with white and silver models available as special-order options. 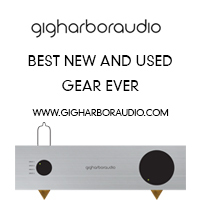 The press reacted favorably to these amplifiers and they sold extremely well. This led Adcom to develop the 300, 400 and 500 series preamplifiers that had a matching design aesthetic along with their operational simplicity. (Nelson Pass had nothing to do with the design of the Adcom preamplifiers, only the power amplifiers) The horizontal louvers running along the top of those early Adcom pieces became a visual signature for Adcom for 25 years, as distinctive as the blue McIntosh meters. 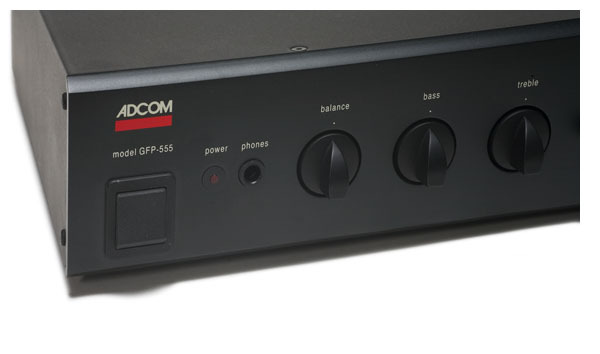 Adcom expanded the line with the GFP preamplifiers to the GTP series with built-in tuners. These were also great preamplifiers that included a high-quality FM tuner at a reasonable price. But my favorite piece from this period was the GFP-555, which did not include a tuner. This preamplifier had a very straightforward design, making use of control knobs with a pointer shape that left no doubt as to where they were set, along with a simple tape-monitor layout that was easy to use, as many of us still had tape decks back then. Recognizing that budding (and some seasoned) audiophiles still wanted basic tone controls, the GTP-555 had very useable bass and treble controls that only worked at the extremes of the frequency spectrum, as well as a loudness contour button. Low and high filter buttons were also included for those still listening to grumbly turntables or AM radio. There are even a few convenience outlets on the back panel to remind you of the days of audiophilia before power cords became a component. A look under the hood of the GFP-555 shows it to be an extremely simple layout. Only two pairs of short ribbon wires, a blue one for each of the selector knobs, and a black pair for the phono section, and that’s it. The simple gain-path philosophy is readily apparent. There really are not many components soldered onto the board, helping to explain the rather relaxed, non-technical sound. 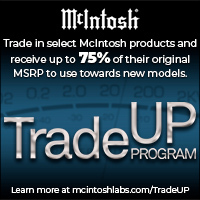 The dilemma that the potential GFP-555 buyer faces is whether to purchase an original or a mk. II. The mk. II has a beefier power supply and some signal path upgrades, but the original 555 features a low-output moving-coil phono option (100 ohm impedance) as well as variable capacitance loading on the moving magnet phono input. Both units fetch about the same price on the used market, so choose according to your needs. The mk. II has slightly less invasive tone controls (+/- 6db at 40hz and 15khz in the original vs. +/-6db at 20 hz and 20khz in the mk. II), though the option of bypassing the output capacitors in the mk. II has been eliminated because, Adcom claims, the high-quality caps now used do not affect the output signal. In the earlier version, the user had the option of using the “Lab” outputs with no output coupling capacitors or the normal outputs, which had a cap in place. Purists can still bypass the output capacitors on the mk. II, but it is a permanent move that requires jumpers and soldering iron. The big question with vintage gear is how well it physically stands the test of time. Almost all components 25 years old or older will probably require some or all of the capacitors to be replaced, and that should be factored into the purchase price. The review piece did have one cap replaced about a year ago, but it was given a clean bill of health upon inspection. The technician involved even offered to buy the unit. The previous owner had taken good care of this preamplifier, so the buttons still worked fine and there were no scratches on the knobs or front panel. The technician mentioned that durability of mechanical parts was a strong point of Adcom units of that era. In the mid 1980’s when I purchased a GFP-555 for the first time, the compact disc was a new development and I had just started my career as a teacher. One of the first 10 discs I purchased for my collection was The Who’s Quadrophenia, still one of my favorite rainy-day discs. This certainly brought back some great memories and was the first disc I cued up. The GFP-555’s overall mellow presentation actually helped this disc somewhat, as well as my CD copy of Carole King’s Tapestry, giving it a bit more sultry feel, like the LP that I once owned. The phono section pared up well with my basic Technics/Grado combination. It won’t make you abandon an out-board phono stage, but if you are shopping at this level, that’s probably not an issue. Beginning or occasional LP listeners should find the on-board phono stage more than adequate. 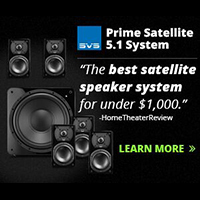 While not up to the level of a CJ, Krell or ARC preamp of the same period, the GFP-555 still offers solid performance and value for about one-third of the price, just as it did when it was new. If you are looking for the cornerstone for a mid-80s vintage system, the Adcom offers great bang for the buck, with clean, used examples going for about $175-250 on Audiogon or eBay.